INI files are a simple but powerful means of storing a program’s configuration. They have existed since the 16 bit Windows times, where they were stored in the Windows directory, later on they were stored in the program’s executable directory and nowadays they usually go somewhere into a user’s home directory. Microsoft has tried to replace them with more structured storage, first the Registry and later (in dotNET) with XML files, but they are still popular because they are simple to copy and move around, easy to use and can be edited with a text editor. Programmers and system administrators love this kind of configuration. They have one problem, though: They tend to get larger than expected and since they are only barely structured, it is rather tedious to compare them. Is there anybody who has not edited an INI file in notepad and changed the order of sections and entries so he can use a tool like Beyond Compare to find the actual differences between two INI files? I have done that a lot more often than I care to remember and it was always painful and slow. Using either it also tries to keep comments where they belong (I use // to mark comments, even though Microsoft proposed a semicolon, but unfortunately the TIniFile implementation in Delphi removes these latter comments while it leaves // comments intact.). The most useful function is probably sorting by template. It allows you to resort e.g. 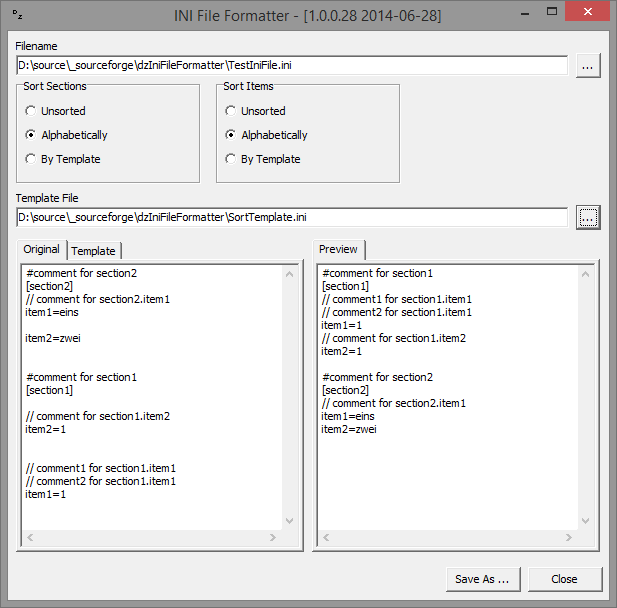 a modified version of an INI file so it matches the original and can easily be compared using the above mentioned Beyond Compare or any other side by side file comparison utility. (no longer on SourceForge) and I have just now uploaded a pre-compiled executable. I hope you’ll find this tool as useful as I did. If you have any suggestions, please contact me via google plus (see link in the upper right corner).